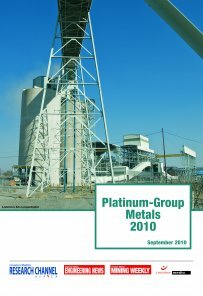 This report offers insight into the global and South African platinum-group metals industry, and profiles the main producers operating in the country. Note: The global market section of this report draws heavily on the Johnson Matthey Platinum 2010 report. Johnson Matthey is the world’s leading authority on the production, supply and use of PGMs. The company’s scope includes the manufacture of autocatalysts, process catalysts and speciality chemicals, and the refining, fabrication and marketing of PGMs.